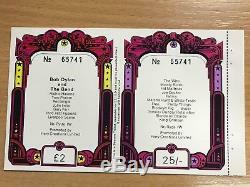 Very psychedelic original weekend ticket for the 69 IOW Festival with Bob Dylan and the Who headlining. This ticket was carefully removed from a surviving partial book of unsold tickets years ago. 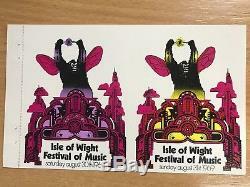 The item "1969 Isle Of Wight Festival Tickets" is in sale since Sunday, September 23, 2018. This item is in the category "Music\Music Memorabilia\Artists/ Groups\The Who". The seller is "91drawnomis" and is located in Hull. This item can be shipped to United Kingdom, Austria, Belgium, Bulgaria, Croatia, Cyprus, Czech republic, Denmark, Estonia, Finland, France, Germany, Greece, Hungary, Ireland, Italy, Latvia, Lithuania, Luxembourg, Malta, Netherlands, Poland, Portugal, Romania, Slovakia, Slovenia, Spain, Sweden, Australia, United States, Canada, Brazil, Japan, New Zealand, China, Israel, Hong Kong, Norway, Indonesia, Malaysia, Mexico, Singapore, South Korea, Switzerland, Taiwan, Thailand, Saudi arabia, South africa, United arab emirates, Chile.